Europe has just sailed up the agenda at the Tory party conference, with Theresa May suggesting curbs on EU immigration and David Cameron hinting at another EU veto. Speaking of the ongoing talks over the EU’s long-term budget (2014-2020), Cameron said: "If it comes to saying no to a deal that isn't right for Britain, I'll say no." The problem for Cameron is that unless anything changes, the EU budget talks will almost certainly generate a bad deal for Britain, both in terms of content and cash contribution. For various reasons, EU budget talks are always biased towards the status quo, as special interests – such as the farming lobby – block meaningful reform through individual member states’ vetoes. Therefore, on its current path, the UK will keep its rebate from the EU budget, but the EU’s odd spending priorities will remain. This means that around a third of the EU budget will continue to go towards subsidising landowners – irrespective of whether they’re engaged in any meaningful economic activity. Another large portion – the so-called structural funds – will continue to see cash pointlessly recycled between some of Europe’s richer regions and countries and spent on projects with little, no or negative impact (though another chunk goes to Europe’s genuinely poor regions). The EU’s new long term budget could account for roughly €130-140 billion a year – not a huge amount in the grand scheme of things – but with Europe facing a solvency, competitiveness and banking crisis all at once, this money could still make a big difference if targeted properly. It’s therefore absolutely maddening that the EU budget remains unreformed on its content. At the same time, even if the UK manages to get what it’s pushing for – an inflation-adjusted cash freeze (based on 2011 payment levels) – the UK’s net contribution will still increase, since more money will (rightly) go to newer member states which aren’t covered by the UK’s rebate. In turn, any actual increase – and it’s heading in that direction in the ongoing EU talks – will naturally mean an even larger net contribution for the UK. Therefore, Cameron is a very unenviable situation: even if he gets what he wants in negotiations, UK taxpayers will still be forced to cough up more cash to pay for the EU (in net terms). Clearly, this could be politically damaging. So how can he get out of this? As I’ve argued before, he should instead use the veto to seek the repatriation of the structural funds for richer member states (with a GDP of 90 per cent or above the EU average). This would reduce the UK’s net contribution substantially – possibly by several billions over next budget framework. At the same time, the UK would remain committed to support Europe’s poorest, as all post-communist member states that joined in 2004 and 2007 would do better from the funds (for how to deal with Italy, Spain and Greece – the only countries in the EU actually losing out under this proposal – see here). UK regions and urban areas also need far better tailored and targeted cash than what is offered by EU funding. In addition, as this was originally a Labour policy, it has the potential to gain cross-party support at home. Now, as ever in EU politics, this isn’t uncomplicated. 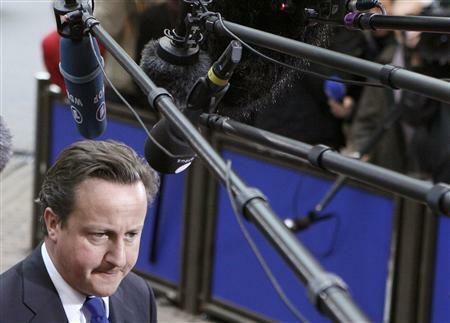 If Cameron insists on the veto, it won’t necessarily stop the process. At worst, it could lead to an ad hoc deal decided on a year-by-year basis through Qualified Majority Voting. But most member states have a huge incentive to avoid this happening. It would be extremely messy and most of them would lose out substantially compared to a new deal. Therefore, targeting the structural funds for reform remains the best option for Cameron – by far. Beyond party politics, it’s the right policy to pursue, as it would benefit both the UK and Europe – and finally inject some common economic sense into the EU budget. He should keep his eyes on the ball. Which is a full reneg of all Treaty terms. An occasional success for Britain would not be bad especially on topics like budget, structure funds and agriculture. But more important is getting the the reneg started with occasional successes from here to the next election. Barosso looks in favour of starting things of course in order to be able to get his way with the EZ, but realises he has to get the UK issue of the agenda to do that. Who cares what 'Cast Iron Pledge' Cameron says? No-one caould believe a word he utters. The P.M. in trying to delay even making a promise about a referendum is simply annoying people. There is a majority in favour of a referendum. Most of them want it to be IN/OUT. Twiddling round the edges will not reduce our contribution significantly or reduce EU influence on most areas of our lives. The majority have had enough. Open Europe greatly underestimates what is needed fo Britain. Briitain should veto the whole budget process PENDING serious negotiations about our whole future in or out of the EU. Of course if Tories abstain in the election and Labour gets in THEY will tackle the problem but by then the [tory] party will have a new leader with more honesty and a more honest policy and Milliband won't have a clue. Cameron's only hope of winning the 2015 general election is to hold a referendum before or simultaniously with the general election . Better , a general election soon now accompanied by an In/Out referendum could be won and get rid of the lib/dems . Cameron should stand down as PM and perhaps hand over to David Davis , the only alternative I can think of . Trying to repatriate EU laws won't wash with the British public . Now at 75yrs I think Cameron is the most incompetent PM that I can recall, does he ever get anything right . Banking union: moving forward or standing still? Labour and ‘Europe’: substance or party politics?